My department has been co-sponsoring topical symposia for the past few years, first on the Great Salem Fire of 1914, and last year on northern slavery. These are day-long events, very much open to a very participatory public. This year, we are focusing on the Salem Witch Trials, in recognition and commemoration of its 325th anniversary, as well as the imminent dedication of the Proctor’s Ledge execution site. The Trials are a rather intimidating topic to take on, especially as we are attempting to focus not only on the well-established narrative of events but also on their comprehensive impact on Salem’s own history and identity: time and place. The symposium, entitled Salem’s Trials: Lessons and Legacy of 1692, is jointly sponsored with the Salem Award Foundation and the Essex National Heritage Area, and will be held on June 10: the registration will be live in a few weeks and I’ll post a link here. The symposium committee has been meeting for a year and I think we have a great program: presentations and panels on the trials themselves, teaching the trials (a key challenge for educators in our region), some European comparisons and context, a panel on the making of Witch City, an opportunity for descendants of the victims to record their “testimonies”, the attendant expertise of Salem experts Emerson Baker, Margo Burns and Marilynne K. Roach, and a keynote address by Dr. Kenneth Foote of the University of Connecticut, author of Shadowed Ground. America’s Landscapes of Violence and Tragedy. It’s rather late in the game to add anything, but I keep thinking we’re missing something, something about the dreaded “pit of presentism” into which the discourse of 1692 always seems to fall. I suspect presentism will pop up in several places, however, and most definitely in the discussion on the development of the “Witch City” identity. We had hoped to keep this discussion centered on a relatively distant past–the 1890s in particular–when you start seeing witches on everything coincidentally with the 200th anniversary of the Trials–but I’m realizing that we can’t stop there: we must proceed to the 1950s, when the solid foundation of witchcraft–presentism was laid with the sequential publication of Marian Starkey’s The Devil in Massachusetts. A Modern Inquiry into the Salem Witch Trials (1949) and Arthur Miller’s The Crucible (1953). From that point on, psychological diagnoses, allegories, and moral judgements flow, and flourish. The 1890s Witch City projections are coming from inside Salem, and are strictly commercial, taking the form of logos and trinkets for the most part, but the 1950s projections are external and national, even international, derived from the massive popular reception of Starkey’s and Miller’s works–and all the publicity they both received. Just look at this lavish spread of photographs by Nina Leen taken for a feature article on The Devil in Massachusetts in the September 26, 1949 issue of Life magazine: Starkey with her cat and wandering around Gallows Hill, “the girls”, a Putnam descendant posing, the newly-restored Witch House. Salem as set piece. Photographs by Nina Leen taken on August 8, 1949 for the September 26 issue of Life magazine, ©Time, Inc.
And onto this set strode Arthur Miller (who strangely does not credit Starkey), inspired to write the play that is continuously on stage and in print and is as much or more about his time as their time. The past as present for all time, it seems. One of the academic projects that I’m working on concerns English physicians who rendered judgements on witchcraft cases in the seventeenth century: some were skeptical but others were not, and the latter group often had to engage in intellectual contortions in order to justify their beliefs. One physician who didn’t have a problem with proclaiming that he believed in spirits and witchcraft was John Beaumont, a Somerset surgeon (and geologist) who wrote an amazing treatise entitled An Historical, Physiological, and Theological Treatise of Spirits, Apparitions, Witchcrafts, and other Magical Practices, which was first published in 1705. Beaumont is among the last of these men of “science” who gave credence to supernatural agency: this is the Age of Newton after all! But he is steadfast in his beliefs, and determined to contradict those who deny the presence and power of spirits, whether good or evil. An edition of the Beaumont’s book came up for auction the other day and I thought I might bid on it, but then quickly dismissed the notion (it fetched a bit over $1000, and is also available for three times that here). Nevertheless, Beaumont was on my mind, so I thought I would delve into his, again. Beaumont’s methodology is interesting. In typical early modern fashion, he quotes a lot of classical “authorities”, as well as testimony from key seventeenth-century trials. All of this he presents as sensory evidence: “proving” the existence of spirits through their perception by four of the five senses (apparently it is impossible to taste one). His personal experience with spirits–which he calls genii–really singles him out among other authors in this genre, however: he seems to delight in giving us every little detail of these “extraordinary visitations”. We get a physical description of the genii, what they were wearing, what they conveyed, what their names were. Beaumont is also an exhaustive reader, consulting every possible source to examine how spirits might be accessed through dreams and ritual magic as well as the senses. Beaumont is also interesting because he considers the Salem trials at length, consulting all the authorities who are not as authoritative in 1705 as they were in 1692. Ultimately it’s all about his own authority, however, his own “empirical” evidence: I am convinced by my own Experience (which to me is as a Thousand Witnesses) that there is such a thing, as Spectre-Sight, so that one Person may see Spectres, when others present at the same time see nothing; wherefore I think it is not Impossible that the afflicted Persons in New England should see; nay, I believe they saw the Spectres of Persons, who as they conceived, Tormented them……Well there you are, even though spectral evidence had been condemned widely in both England and New England over the past decade, Beaumont remained a true believer in 1705. Frontispiece by Michael Van Der Gucht. Witchcraft and witch trials are by no means an academic focus for me, but any European historian who studies and teaches the early modern era must take these subjects on. Consequently I developed an undergraduate course called “Magic and Witchcraft in Early Modern Europe” just a few years after I came to Salem, in part because I also felt that I had a certain obligation, given the local unawareness of the fact that over 100,000 people were put on trial for witchcraft in the sixteenth and seventeenth centuries across Europe and the consequential belief that the 1692 trials were the largest/most important/consequential in world history. My course goals consequently included: 1) putting the Salem Trials in a wider geographical and chronological perspective and; 2) placing the European witch trials in a longer and larger intellectual tradition, hence the “magic”. The course title is partially a misnomer, as we spend half our time in the medieval era, laying essential theological and historical groundwork, and the last few times I taught it, I became somewhat stalled in the fifteenth century. I think this was a bit frustrating for my students, as the most intensive period of witch hunting was the century between 1560 and 1660 (can’t we get to the trials? ), but the more I studied both the primary and secondary texts the more I came to realize that the fifteenth century was absolutely key to the intensification that was to come. This is true not only because of the publication of the famous Malleus Maleficarum, an incredibly accessible, even riveting, “how-to” manual of witch identification and prosecution which itself is a consequence of fifteenth-century trends regarding what was seen increasingly as a “pestilential heresy” on the Continent, but also because of the visualization of diabolical witchcraft, most prominently in Ulrich Molitor’s De lamiis et pythonicis mulieribus (‘On Witches and Female Soothsayers, 1489). A Professor of Law at the University of Constance, Molitor’s point of view is traditional in terms of his opinions on witchcraft, unlike the more radical authors of the Malleus, Heinrich Kramer and Jacob Sprenger, whose perspectives were inquisitional rather than reasoned. In the course of a ten-chapter dialogue, Molitor ultimately concludes that witches are generally products of demonic illusion. So his words did not incite, but one could argue that his images did, as De lamiis was the first illustrated treatise on witchcraft, and a text with a remarkably long run: 43 editions were published between 1489–1669—more than the Malleus Maleficarum. 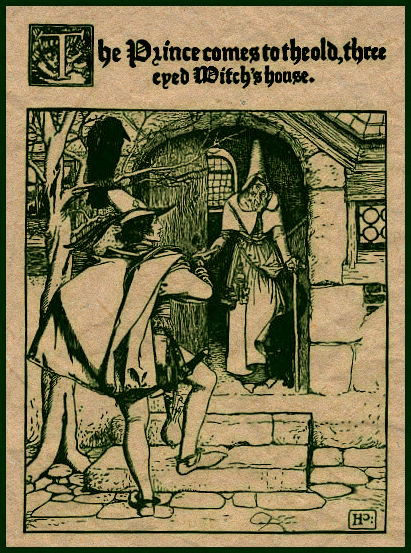 Molitor’s insistence on the illusionary powers of witches was definitely undercut by the inclusion of woodcut illustrations of middle-aged “witches” engaging in some of the things Kramer and Sprenger accused them of: stirring up storms, flying to the sabbat, frolicking with their demon lover. And so, in both words and woodcuts, stereotypes were created, and cemented over the next century. Woodcut illustrations from the 1489, 1500, and 1544 (last one) editions of Ulrich Molitor’s De lamiis et phitonicis mulieribus. [first published in Reutlingen: Johann Otmar, not before 10 Jan. 1489]. University of Glasgow Sp Coll Ferguson An-y.34. For more and the later visualization of witches and witchcraft, see Charles Zika’s excellent The Appearance of Witchcraft: Print and Visual Culture in Sixteenth-century Europe. Nearly every year, someone from “outside” writes an opinion piece on the exploitative, hypocritical, and tacky nature of Salem’s month-long celebration of Halloween which is pretty much ignored here in the Witch City. Last year, there was a riveting piece by a Huffington Post columnist, and this year we have a column by the Pulitzer Prize winning author Stacy Schiff, who just happens to have a book coming out about the Trials entitled The Witches: Salem 1692. Schiff’s piece has a great title, “First Kill the Witches. Then Celebrate Them”, and asks the key question, “How did Salem, Mass. repackage a tragedy as a holiday, appointing itself Witch City in the process?” but offers few new insights in the way of an answer. It’s the same old inevitable story, told time and time again: economic decline, Arthur Miller, Bewitched, entrepreneurial “Museum” owners, shopkeepers, and Wiccans. She really dwells on the dreadful Samantha statue (which I don’t think Salemites take a seriously as we perhaps should) and concludes that “You can leave Salem today without a hint of what happened in 1692; in a sense we’ve moved from tragedy to farce without the pause for history in between”. At first reading, this seems like a great line, but I’m not sure about the use of the collective “we”, nor of the reference to history–as the Salem Witch Trials is one of the most intensely researched topics in American history. Every year we get a new Salem book or three or four, while notable trials in Europe during the same era have yet to receive even sufficient attention. Yet we seem to learn very little, or just want to read the same old (inevitable) story, over and over again. I haven’t read Schiff’s book yet–it comes out this week–but I did read her preview article in The New Yorker last month and found it to be rather….conventional, and quite dependent on the well-worn path of context and causality charted by historians like Richard Godbeer, Mary Beth Norton, and my colleague Emerson Baker (and generations before them). Nevertheless her publisher asserts that the book is “historically seminal” and I keep seeing the words “masterful” in initial reviews. The word “new” crops up a lot too but it seems like the same old story to me. In terms of novelty, I’m a bit more interested in the book that seems to be paired and compared with Schiff’s Witches in reviews due to their coincidental, opportunistic publication dates, Alex Mar’s study of contemporary Paganism, Witches in America. The most recent scholarly publication, Benjamin Ray’s Satan & Salem. The Witch-Hunt Crisis of 1692, seems to be getting squeezed out by these two blockbusters, although it was published earlier in the year. 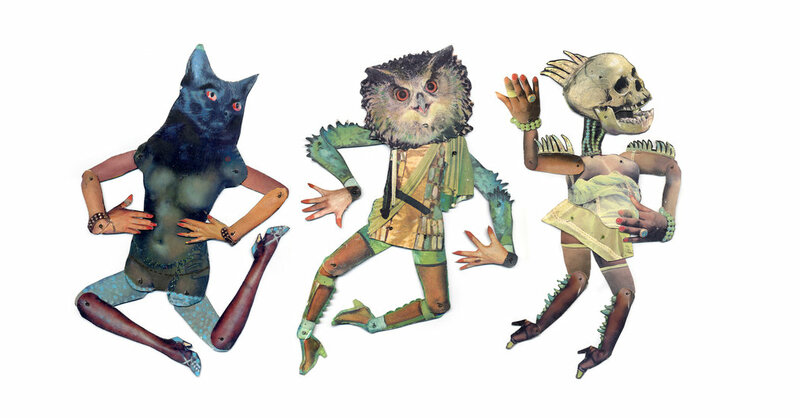 Martha Coburn’s illustrations for Stacy Schiff’s Oct. 25, 2015 column in the New York Times: “First Kill the Witches. Then, Celebrate Them”. 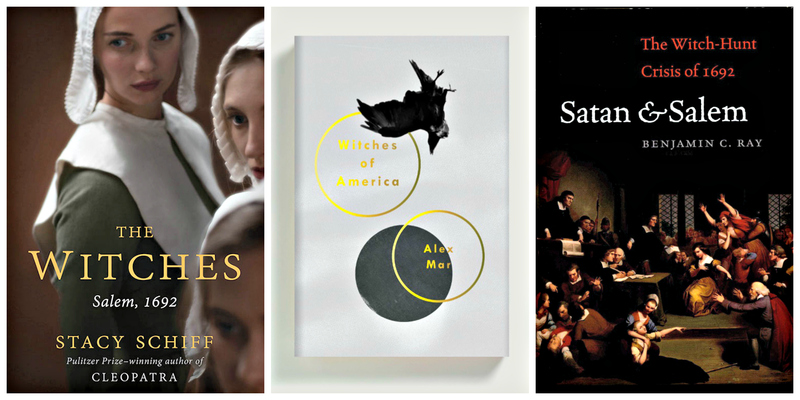 Just three witchcraft titles published in 2015. There is a great review of Schiff’s work by a historian who I really admire, Felipe Fernández-Armesto, in the Wall Street Journal which praises the author on her narrative abilities and contemporary allusions but faults her on her knowledge of the historical context: he observes that “Her knowledge of the 17th century is less secure than her grip on journalistic topoi.” Indeed it is difficult to develop mastery of personages as diverse as Cleopatra, Véra Nabokov, and the victims of Salem. Despite the glut of Salem Witch Trials studies, Fernández-Armesto believes we have room for one more: “We still need someone to do for 17th-century Salem what Emmanuel Le Roy Ladurie did for 14th-century Montaillou in his work on the Cathars”. 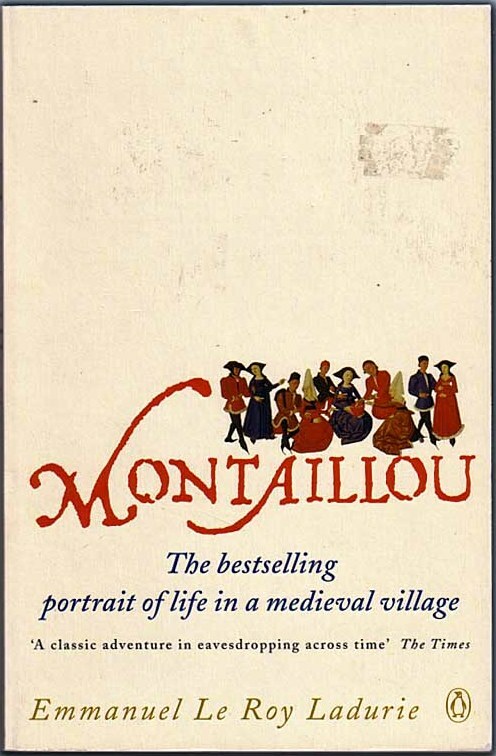 That would be a dream as Montaillou: Promised Land of Error is indeed one of my favorite books, but I don’t think Salem–the city, the “problem”, the industry–is ready for that kind of definitive l’histoire totale: “we” need to continue our search for the “real” story and feeding the beast. 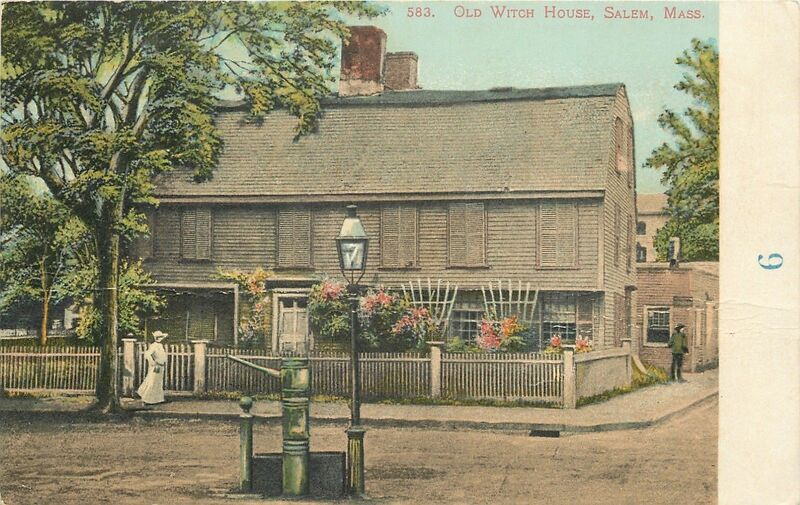 Central to Salem’s evolution as the Witch City was the Witch House, a first-period structure that was the residence of one of the Trials’ judges, Jonathan Corwin. It was referred to as the Witch House back in the nineteenth century, when it housed a number of businesses–a longstanding drug store, later an antiques shop–and looked quite different than it does today, but it really became the Witch House when its evolving image was published on variant postcards from around 1900 on. 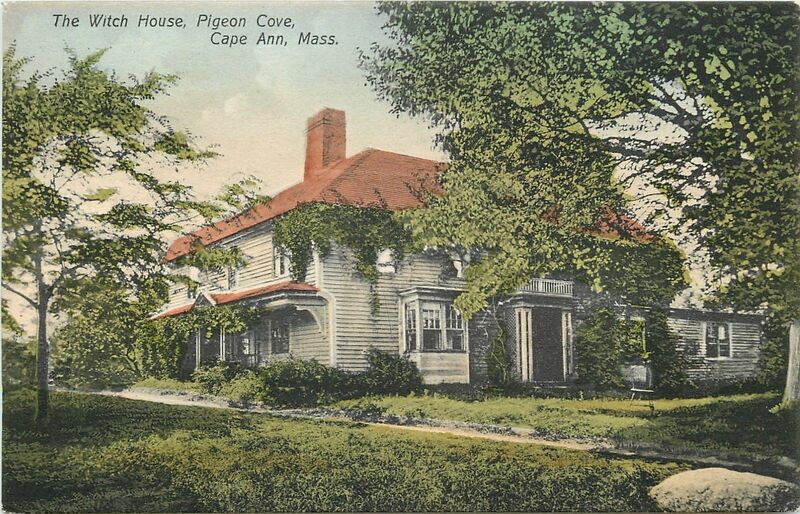 The Corwin House acquired its seventeenth-century look in the middle of the twentieth century through a “restoration” under the direction of Boston architect Gordon Robb, and was opened to the public as the official “Witch House” by the city of Salem in 1948. 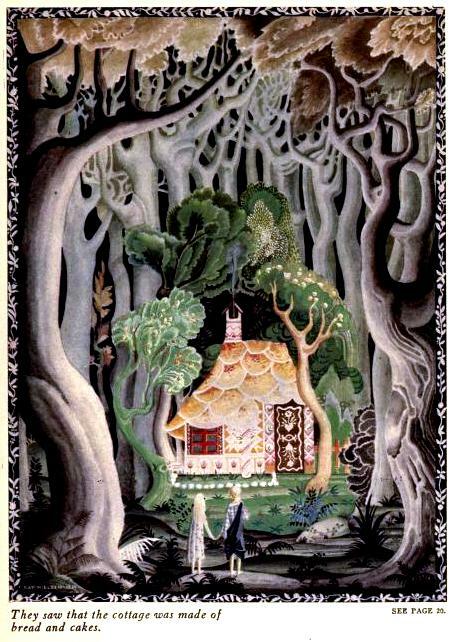 As I’ve written about this House and its history before, I want to widen its context today by featuring some other Witch Houses, near and far, past and present, material and immaterial. 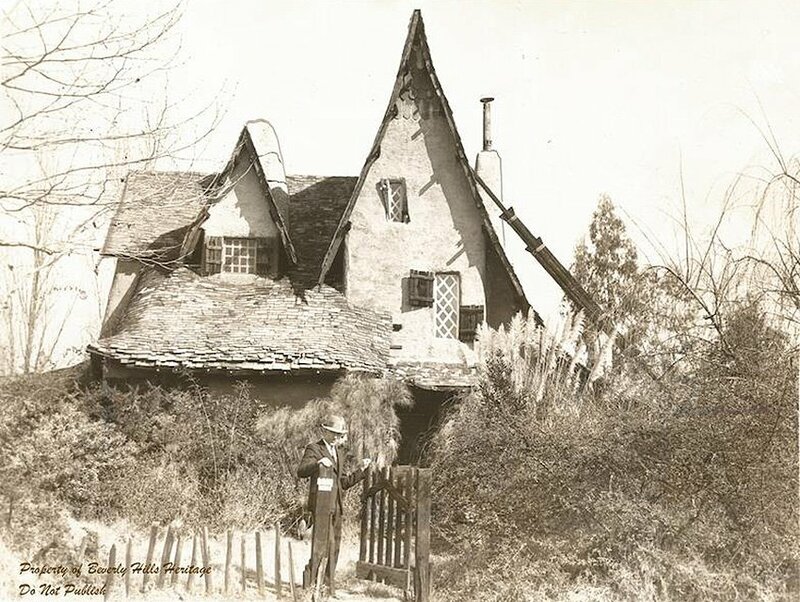 There are at least two other houses in Essex County which were identified as such on postcards from a century ago, a time when there was a limited effort to turn the entire region into “Broomstick Country”. This was historically correct–the “Salem Witch Trials” were indeed a regional phenomenon–but commercially tricky, so Salem eventually claimed its exclusive title as the one and only “Witch City” with the Witch House. 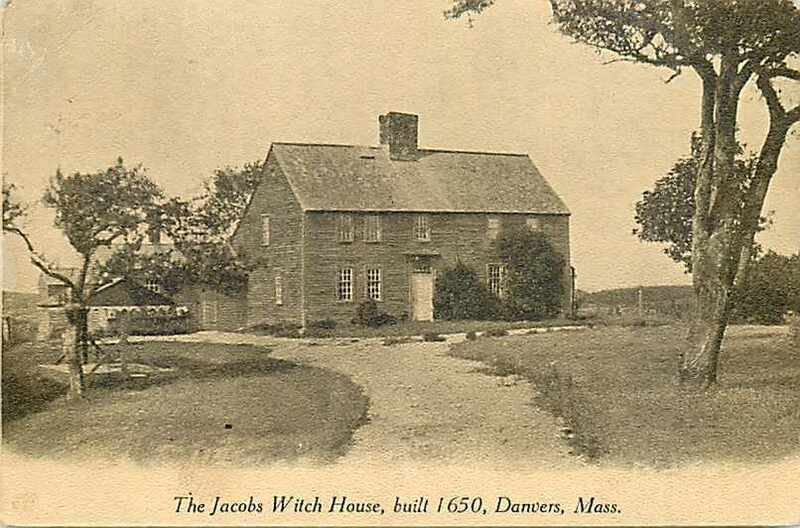 Salem’s “Witch House” in 1893 (Columbus and Columbia Manufacturers’ Book Co, c 1893) and 1905: the George Jacobs “Witch House” in Danvers in 1907 (located in what was then Salem in the seventeenth century) and Rockport’s “Witch House”, also known as the “Old Garrison House” and still standing, in 1910. Supposedly two brothers from Salem built this house as a refuge for their accused sister or mother (depending on the source). Farther afield, Witch Houses don’t have anything to do with witch trials: they just look like the sort of gothic structure that a romanticized witch might inhabit, like the Spadena “Witch’s” House in Beverly Hills, California, a storybook-style house built in 1921, or the famous Carl Van Vechten photograph of a long-lost “Witch House” in rural Maine during the Depression. The fairy-tale witches of the nineteenth century had created a more whimsical images of their houses in the twentieth, and clearly gables were seen as integral architectural details, so it is quite suitable that Salem’s Witch House would soon be enhanced with several. 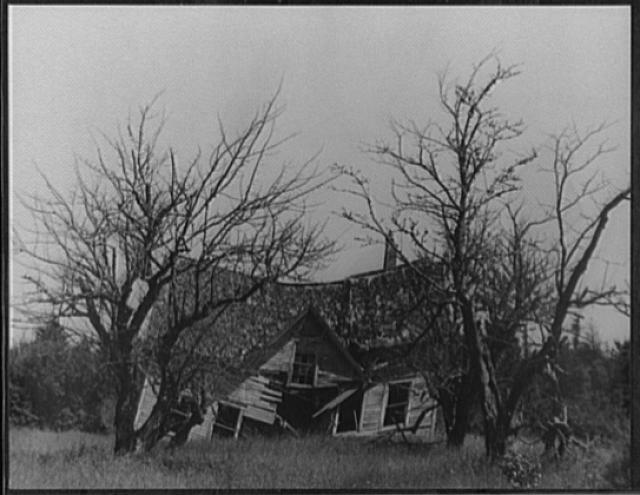 The California “Witch’s House’ in its original Culver City location, courtesy Beverly Hills Heritage; Carl Van Vechten, “Witch House”, 1936, Library of Congress; the Prince visits the Witch’s House in Howard and Katharine Pyle’s The Wonder Clock: or, Four & Twenty Marvelous Tales, Beind One for Each Hour of the Day (1887); The Witch’s confectionary cottage from Hansel and Gretel, by Kay Nielsen (1921). 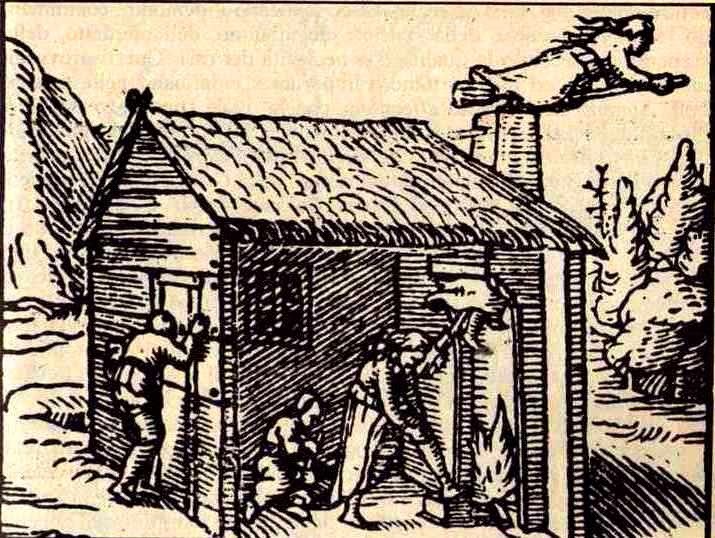 Even farther afield in terms of both space and time is the woodcut print of a Witch House from the later sixteenth century by an anonymous English artist. This image, quite unusual as witches were generally depicted outside, in the wild, at this time, is often cited as appearing in the Swiss theologian Thomas Lieber (Erastus)’s Two Dialogues Concerning the Power of Witches (1579), but as Charles Zika points out in The Appearance of Witchcraft. Print and Visual Culture in Sixteenth-century Europe, the image appears to have been simply inserted into a 1579 English edition. Another fantasy house, although in this case it’s more about the exit than the architecture!